Online food delivery has just been given its greatest novelty yet, an unmanned helicopter that delivers tacos straight to you. This new concept, called Tacocopter, is a new startup out of Silicon Valley which has recently garnered a huge internet following. The idea behind Tacocopter is that anyone can order tacos on their smartphone, which will send a GPS location to the unmanned drone helicopter. The helicopter will then be equipped with made-to-order tacos and will fly out to find you and drop your food off right where you’re standing. Payments will happen online, making it a simple process for the helicopter to drop off your tacos and immediately fly back to the restaurant to take the next order. The only catch is that Tacocopter isn’t exactly legal in the United States yet. 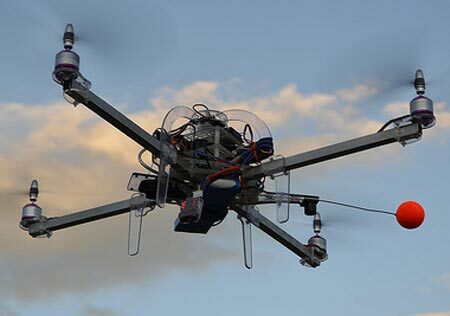 Currently, the U.S. government is blocking the launch of Tacocopter, which has been around since July 2011, because of FAA regulations that prevent unmanned aerial vehicles to be used for commercial purposes. In addition to the FAA regulations, Tacocopter faces a myriad of technical issues such as navigating through urban areas, keeping the tacos warm, creating a city map with precision to ensure that no crashes occur, avoiding birds, telephone wires and anything else that might interfere with the delivery. Indoor deliveries and theft from others are further complications with Tacocopter, keeping the product firmly grounded until some headway can be made. In the meantime, the Tacocopter website is up and running, and offers some enticing visuals to keep us waiting with baited breath until we can start ordering flying tacos. Simpson is currently working on other projects but always heads back to Tacocopter, convinced that the benefits of the product outweigh the barriers. Food delivery by drones could help reach locations previously unreachable, and they could eventually be used to serve customers in restaurants as well. The full implications of this product could transform the food industry, though Simpson states that the goal of Tacocopter is not to replace human labor in the restaurant industry. Ultimately, if Tacocopter ever gets off the ground it should have a huge following, appealing to Americans’ love of food, gadgets, and laziness. With the U.S. government as the primary obstacle keeping Tacocopter grounded, we’re hoping that the FAA can make a small exception for flying taco delivery.